A recent market study published by the company “Cutaneous Fibrosis Treatment Market: Global Industry Analysis 2013–2017 & Forecast, 2018–2026” consists of a comprehensive assessment of the most important market dynamics. After conducting thorough research on the historic as well as current growth parameters of the cutaneous fibrosis treatment market, the growth prospects of the market are obtained with maximum precision. The report features the unique and salient factors that are likely to significantly impact the development of the cutaneous fibrosis treatment market during the forecast period. It can help market players modify their manufacturing and marketing strategies to envisage maximum growth in the cutaneous fibrosis treatment market in the upcoming years. The report provides detailed information about the current and future growth prospects of the cutaneous fibrosis treatment market in the most comprehensive manner for the better understanding of readers. The report commences with the executive summary of the cutaneous fibrosis treatment market, which includes the summary of key findings and key statistics of the market. It also includes the market value (US$ million) estimates of the leading segments of the cutaneous fibrosis treatment market. Readers can find the detailed taxonomy and the definition of the cutaneous fibrosis treatment market in this chapter, which will help them understand the basic information about cutaneous fibrosis treatment market dynamics, supply chain, cost structure and pricing analysis. A list of key distributors and suppliers, as well as a list of key market participants is included in the report. This chapter includes a detailed analysis of the historical Cutaneous Fibrosis Treatment Market along with opportunity analysis in the future. Readers can also find absolute opportunity for year (2018 – 2019) and incremental opportunity for forecast period. Based on the type, the cutaneous fibrosis treatment market is segmented into corticosteroids, anti-fibrotic drugs, immunotherapy and immunoglobulins. In this chapter, readers can find information about the key trends and developments in the cutaneous fibrosis treatment market and market attractiveness analysis based on the drug class. Based on the route of administration, the cutaneous fibrosis treatment market is segmented into oral, injectables and topical. In this chapter, readers can find information about the key trends and developments in the cutaneous fibrosis treatment market and market attractive analysis. Based on the indication, the cutaneous fibrosis treatment market is segmented into Keloid, Scleroderma, Radiation-induced Skin Fibrosis and GvHD Associated Cutaneous Fibrosis. In this chapter, readers can find information about the key trends and developments in the cutaneous fibrosis treatment market and market attractive analysis based on indication. Based on the distribution channel, the cutaneous fibrosis treatment market is segmented into hospital pharmacies, retail pharmacies, drug stores and online pharmacies. In this chapter, readers can find information about the key trends and developments in the cutaneous fibrosis treatment market and market attractive analysis based on the distribution channel. This chapter explains how the cutaneous fibrosis treatment market will grow across various geographic regions, such as North America, Latin America, Europe, Asia Pacific Excluding Japan, Japan, Oceania and Middle East & Africa (MEA). This chapter includes a detailed analysis of the growth of the North America cutaneous fibrosis treatment market along with a country-wise assessment that includes the U.S. and Canada. Readers can also find regional trends, regulations and market growth based on the end users and countries in North America. Readers can find detailed information about several factors, such as the pricing analysis and the regional trends, which are impacting the growth of the Latin America cutaneous fibrosis treatment market. This chapter also includes the growth prospects of the cutaneous fibrosis treatment market in the leading LATAM countries such as Brazil, Mexico, Argentina and the Rest of Latin America. Important growth prospects of the cutaneous fibrosis treatment market based on its end users in several countries, such as Germany, the UK, France, Spain, Italy, Russia and Rest of Western Europe, are included in this chapter. In this chapter, China, India, ASEAN and South Korea are the leading countries in the APEJ region, which are the prime subjects of assessment to obtain the growth prospects of the APEJ cutaneous fibrosis treatment market. Readers can find detailed information about the growth parameters of the APEJ cutaneous fibrosis treatment market during the period 2018–2026. Readers can find important factors that can significantly impact the growth of the cutaneous fibrosis treatment market in Japan during the forecast period based on the market segmentation. In this chapter, Australia and New Zealand are the leading countries in the Oceania region, which are the prime subjects of assessment to obtain the growth prospects of the Oceania cutaneous fibrosis treatment market. This chapter provides information about how the cutaneous fibrosis treatment market will grow in the major countries in the MEA region, such as North Africa, GCC Countries, South Africa and the rest of MEA, during the period 2018–2026. In this chapter, readers can find a comprehensive list of all the leading stakeholders in the cutaneous fibrosis treatment market, along with detailed information about each company, which includes the company overview, revenue shares, strategic overview and recent company developments. Some of the market players featured in the report are Novartis AG, Pfizer Inc., Genentech, Inc. (Merck & Co. Inc.), Sanofi S.A., Boehringer Ingelheim International GmbH, Jubilant Cadista, Horizon Pharma USA, Inc., and Bristol-Myers Squibb Company. This chapter helps readers understand the research methodology followed to obtain the various conclusions as well as important qualitative and quantitative information about the cutaneous fibrosis treatment market. The cutaneous fibrosis treatment market is highly fragmented with number of regional as well as global players in the cutaneous fibrosis treatment market, and it is mainly dominated by large pharma companies with vast as well as diverse product portfolios. Whereas, regional players in the cutaneous fibrosis treatment market also hold significant share which makes the cutaneous fibrosis treatment market highly fragmented. Manufacturers in the market are focusing on developing novel cutaneous fibrosis treatment formulations, since there is no cure available currently. Players in the market are competing on the basis of their regional product footprint, product offerings, and prices of the drugs of same class. The cutaneous fibrosis treatment market is dominated by Pfizer Inc., Novartis AG, Merck & Co. Inc. and other key players. Manufacturers are largely engaging in developing drugs for cutaneous fibrosis treatment and rare diseases such as scleroderma which also comes under cutaneous fibrosis. The advantages of being designed as the orphan drug for treatment of rare diseases often helps manufacturers to cope with high expenditure on clinical trials and due to this reason small and medium companies are also opting for drug development by investing in research and development. Cutaneous fibrosis generally affects people suffering with diseases such as keloids, GvHD, scleroderma, radiation therapies. Cutaneous fibrosis is a rare disease. Limited awareness among healthcare professionals as well as the general population delays the diagnosis and treatment of cutaneous fibrosis. In the last decade, vast studies around the cutaneous fibrosis treatment are being carried out to evaluate treatment options, epidemiology of the disease which are ultimately helping to understand the prognosis of the disease. The prevalence of the cutaneous fibrosis is yet to be decided precisely but the prevalence of the associated conditions such as scleroderma and keloids is well established in majority part of the world. Various studies (surveys) by healthcare groups either sponsored by manufacturers or healthcare organizations expected to focus more evaluating cutaneous fibrosis treatment as well as evaluation of epidemiology which is expected to drive the growth of cutaneous fibrosis treatment market. 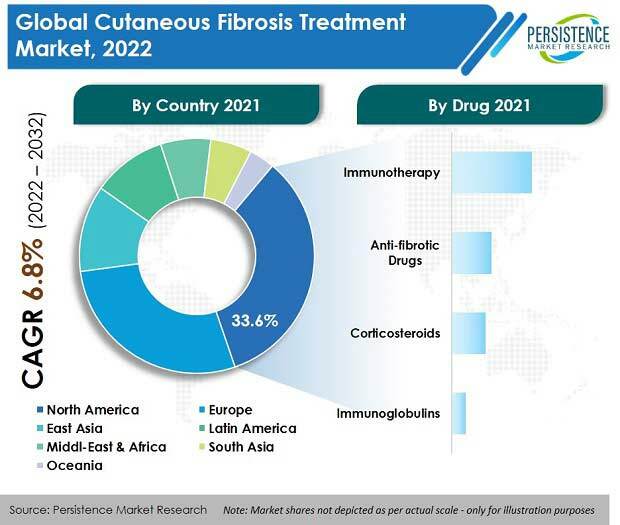 The increasing prevalence of cutaneous fibrosis-associated conditions, such as scleroderma, keloids (severe form), Graft Versus Host Disease (GVHD), and other conditions, is expected to drive the growth of cutaneous fibrosis treatment market. Scleroderma and other cutaneous fibrosis - associated diseases are more prevalent in persons aged above 35 to 40 years. The aging population of the world, especially in the developed regions, is expected to boost the prevalence of cutaneous fibrosis-associated indications, which is, in turn, increasing the prevalence of cutaneous fibrosis. In 2016, around 12.4% of the population of Asia Pacific was aged 60 years and above, which is expected to increase to 25% by 2050. The aging population is growing at faster rate in developing countries as compared to developed countries. For instance, France took over 115 years to transform from an aging to aged society, whereas China is expected to take only 25 years for a similar transition. The prevalence of keloid scars related to physical injuries is also expected to increase with an increase in the number of surgeries, road accidents, and trauma injuries. Fibrosis is associated with various diseases as a morbidity and is a cause of mortality in more than 40% of the deaths occurring in the US. There is no approved therapy for the cutaneous fibrosis treatment. Not a single drug has been approved for the cutaneous fibrosis treatment, which has led drug manufacturers to evaluate the efficacy and action of various drugs for the cutaneous fibrosis treatment. Various companies are evaluating different molecules for the cutaneous fibrosis treatment. This part of the report consists of the profiles of the key players in the Cutaneous Fibrosis treatment market based on their market shares, product offerings, differential strategies, marketing approach, and company dashboard. A few of the important players featured in the Cutaneous Fibrosis treatment market report include Novartis AG, Pfizer Inc., Genentech, Inc. (Merck & Co. Inc.), Sanofi S.A., Boehringer Ingelheim International GmbH, Jubilant Cadista, Horizon Pharma USA, Inc., and Bristol-Myers Squibb Company. Cutaneous fibrosis is the accumulation of extracellular matrix (ECM) components in the dermis, leading to compromised function and altered architecture of the dermis. Development of fibrosis occurs naturally during scar formation in wound repair or is a pathological process in pro-fibrotic diseases. The company conducted a research study on the cutaneous fibrosis treatment market for the forecast period 2018 to 2026. The report offers a comprehensive evaluation of the business opportunities prevailing in the cutaneous fibrosis treatment market, with insights on the prices, current trends, prevalence of cutaneous fibrosis, and reimbursement scenario in the cutaneous fibrosis treatment market. The report offers a comprehensive taxonomy of the market based on the drug class, route of administration, indication, distribution channel, and region. By drug class, the cutaneous fibrosis treatment market is segmented into corticosteroids, anti-fibrotic drugs, immunotherapy and immunoglobulins. By route of administration, the cutaneous fibrosis treatment market is segmented as oral, injectable and topical. By indication, the cutaneous fibrosis treatment market is segmented into keloid, scleroderma, radiation-induced cutaneous fibrosis and GvHD associated cutaneous fibrosis. By distribution channel, the cutaneous fibrosis treatment market is segmented into hospitals pharmacies, retail pharmacies, online pharmacies, and drug stores. The cutaneous fibrosis treatment market has been analysed across the regions of North America, Latin America, Europe, Asia Pacific Excluding Japan, Japan, Oceania, and the Middle East & Africa (MEA). What is the overall revenue generation potential of the cutaneous fibrosis treatment market across the regions? Who are the key regional and global competitors? What are their portfolios in the cutaneous fibrosis treatment market? Epidemiology of the cutaneous fibrosis. What are the major challenges influencing the growth of the cutaneous fibrosis treatment market? The market has been estimated based on a supply-demand approach. The market was first calculated based on the epidemiology of cutaneous fibrosis in different regions/countries. Some of the other qualitative factors analysed include awareness level and the availability of drugs for cutaneous fibrosis treatment for different indications. This information is further validated with rigorous primary research (which includes interviews, surveys, in-person interactions, and the viewpoints of seasoned analysts) and secondary research (which includes verified paid sources, authentic trade journals, and resourceful databases). The research study on the cutaneous fibrosis treatment market also includes the top trends and the macro- as well as micro-economic factors shaping the cutaneous fibrosis treatment market. With this approach, the report on the cutaneous fibrosis treatment market estimates the industry attractiveness of every major segment in the market over the forecast period.